Excerpts from the letters provide some insight into the mechanism, concerns, challenges, and communications difficulties caused by censorship. His daughter Linda Steingart Frumkes supplied the following quotes. The italicized portions give a timeline and background. Read to get a glimpse of what it was like to censor and be censored. 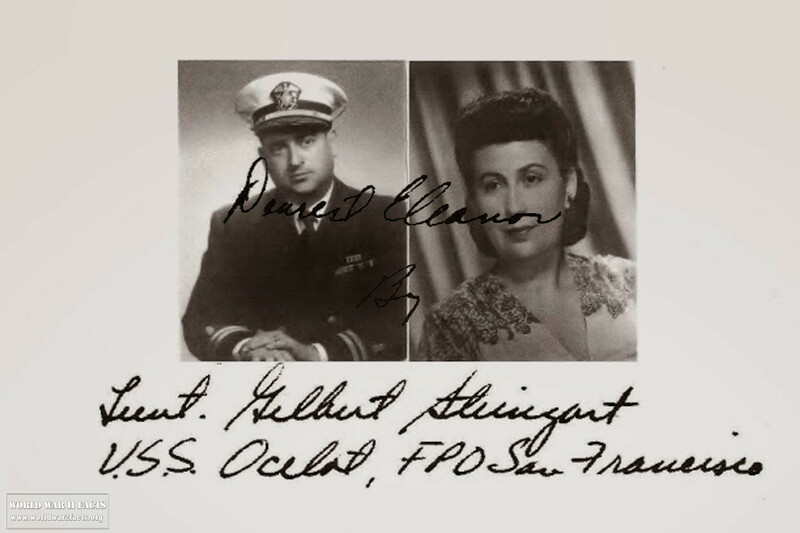 Lt. Steingart reported aboard the USS Ocelot on July 28, 1944. On July 31, 1944 he quipped. Saw one patient this morning and spent the rest of the day learning about the ship and some of my duties. The chow is excellent. Ate three meals today and that is one too many. I'll have to really watch myself or I'll put on plenty of weight (and you Dr., who is censoring this letter, will have to take steps to reduce me). On August 8, 1944, the ship departed from San Diego. January 17, 1945. 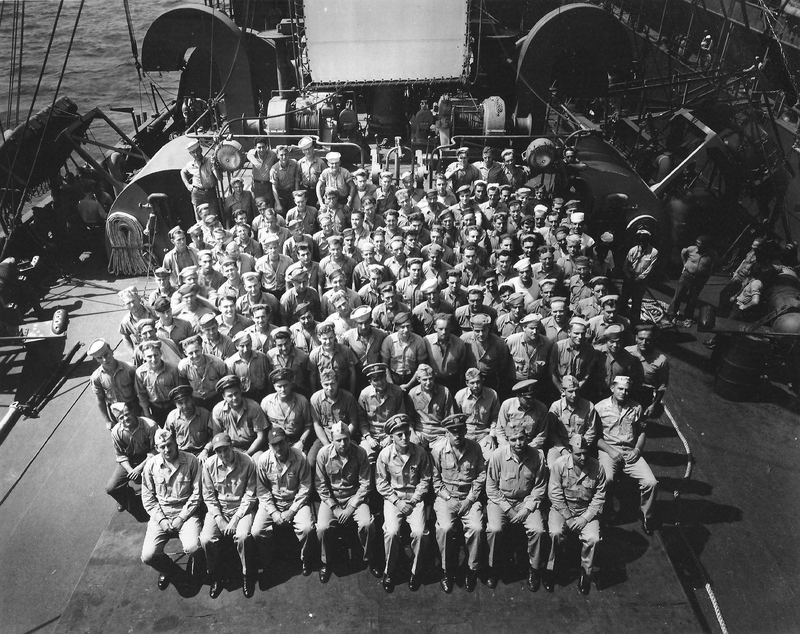 Photo of ship’s company of the USS Ocelot. 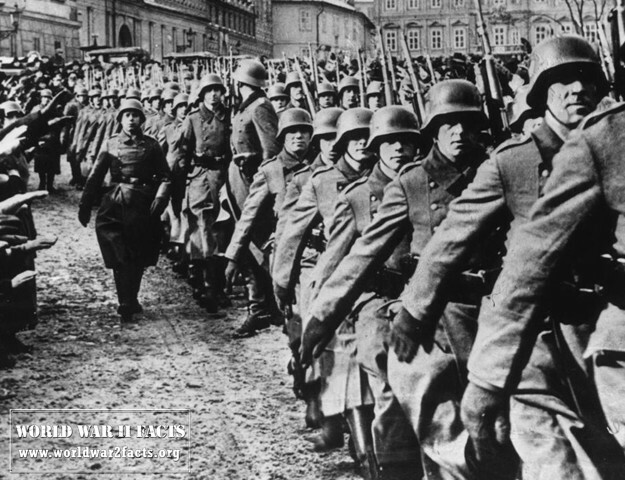 The front two rows are officers. Lt. Steingart is in the front row end on right. Enlisted men are seated behind the officers. I had a haircut this afternoon and then after showering and censoring mail, I finished "China to Me." August 15, 1944. The USS Ocelot arrived in port. A few of us recently visited the largest pineapple cannery in the world. I drank ice cold juice and ate sliced pineapple until it came out of my ears, but I still like the stuff. The tour through the plant takes one hour and I was impressed by the cleanliness of it all. Every bit of the pineapple is used, even down to the shell which is used as feed for cattle. 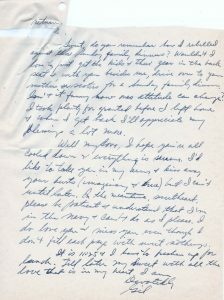 September 3, 1944 he wrote to his wife. 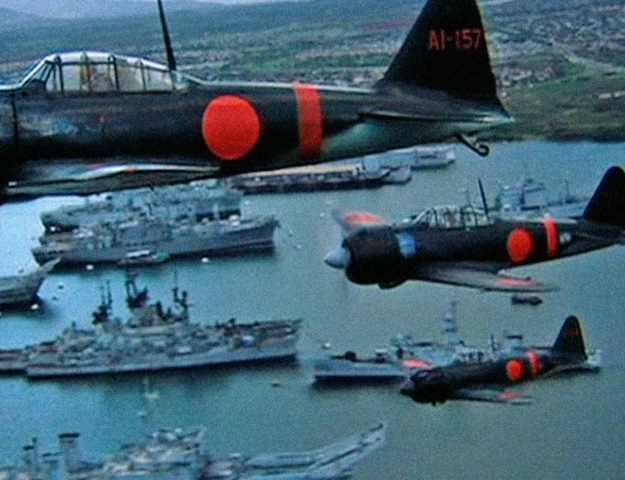 They both knew he was in Pearl Harbor, but couldn't say so. 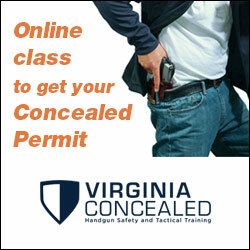 I read and reread your lecture but good God Sweet there isn't a thing I can do about it. Every time I write a longer letter and try to put something of interest in it the censor either cuts it or returns it to me for rewriting. If some of you questions remain unanswered, remember I can't tell you everything. For instance I can't say "I'm going to see "so and so." "so and so" denoting either a place or individual. I can't say how long we may remain in any one place or even what's doing where we are. Yet those permanently based here can do and say practically anything they like. However after we leave here or after I see someone or do something then I may mention it, so please be patient. I'd like to tell you all about my ship duties and whereabouts, but the censor would cut most of it out. I can say that I am the only dentist aboard and that my office is as modernly equipped as was my office at home. In addition to my professional duties for the ship, I act as Welfare Officer which includes arranging recreational activities. In fact just recently our ship had an all day outing at a nearby beach. All the beer and coke the crew could drink was on the house (ship). Also charcoal broiled steaks and hot dogs. We engaged in games of volleyball and baseball and swam in the ocean. Everyone had such a good time that I'm planning another outing as soon as possible. I am also acting as Division Officer for the "H" or Hospital Division. All officers take turns censoring mail. So you see with my extra professional duties, I manage to keep busy. Now for the quiz program. Remember any question I ignore can't be answered because of censorship. Can't say anything about the ship so please don't ask any more. 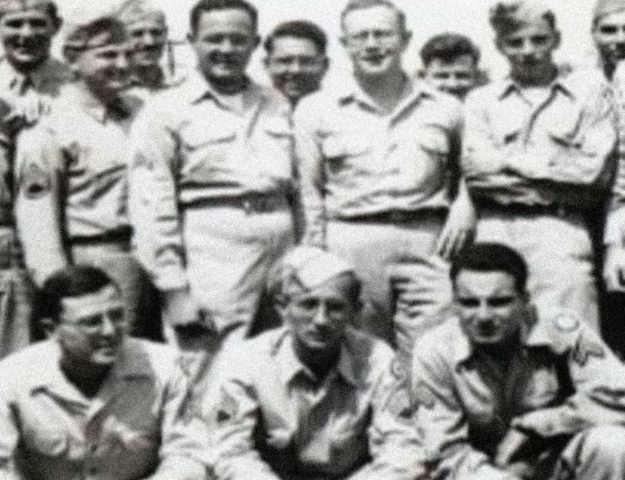 October 16, 1944 Regarding a visit with a friend, Al Klein. You ask about my first visit with Al Klein. That was when I saw him at his station. The reason you got confused is on that is because I could not give you any details as to where, when and I how I met him. October 16, 1944. The holiday mail rush began. Censoring mail varies. I'm supposed to have the duty every six days, but with the Xmas rush we are doubling up now so it'll be more often. This duty was interesting at first but after awhile it gets quite boresome. However I will say this, some sailors do have a sweetheart in every port and they all (the girls) get the same line of bull. 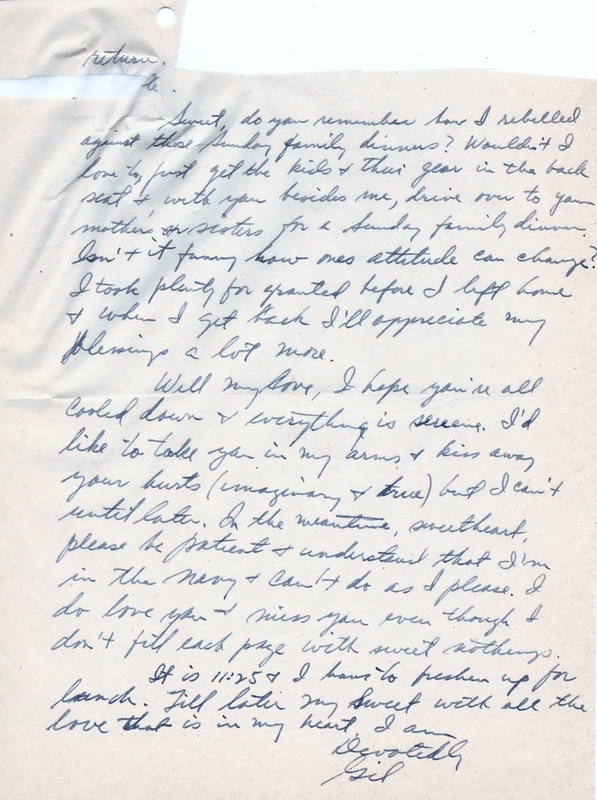 October 22, 1944 Censored/cut page from letter. My, my, so hot and bothered about nothing. Anyway, I haven't ignored your questions ... Sorry, darling that Lillian knew more about my visit with Al than you did but being shore based he can write freely whereas I may not. I've told you that before but you still keep asking where did I go and what did I do. I've tried to tell you and several times the censor has had to cut items out. Please understand dear and when I get back I'll fill in the blank spaces. October 23, 1944 the USS Ocelot departed Pearl Harbor and arrived in port on November 3, 1944. 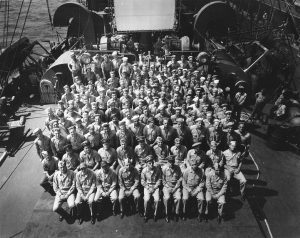 I forgot to mention that we had pictures of the whole ship's company taken yesterday and every man will receive a copy. I hope that the chief censor will allow them to be sent home. January 25 1945. Gil's comments on August 25, 1944 about the Dole pineapple plant in Hawaii slipped by the censors. The Dole plant was very interesting. I thought the censors cut my recount out of my letter to you. Yes dear, we have a date to go back to Hawaii on our fifteenth anniversary. ... about the re-examining censor, one of the officers made some thoughtless remarks in one of his letters and another officer passed it. The re-examiner checked it and now hell is a popping. A copy of the letter has been sent to Admiral Halsey and I guess we haven't heard the last of it yet. Just goes to show how careful one must be in what he says in his letter. How is my Darling today? How's about a kiss? Gee thanks, Honey, but take it easy, what will the censor say? Today was a normal day. Worked this morning, not hard, but steadily. Also this afternoon until 3:00 PM. Then I had a coke, bought some soap in the ship's store and returned to my room to read my mail. I censored a few letters. Talking about censoring mail, one of the men on board, Jewish, writes to his parents in Yiddish and I censored his letter today. It was only a very short note but it took me several minutes to make it out. I don't believe I've read any Yiddish in 7 or 8 years. I suppose all his mail will be brought to me. In a short time I'll be able to read it as fluently as I used to. A little practice is all I need. Some of the men sure write copiously--the amount of mail we censor seems to be increasing daily. Others can dish out a slick line of bull. After censoring many letters and from my own personal experiences I've come to the conclusion that much of the mail is to raise the morale of the civilians at home rather than the men away from home. I still think you are oversensitive and wait for others to make the first move, which they won't. Of course you and I expect more from ... our friends because we always went out of our way for everyone ... If you want entertainment or recreation, or even companionship you've got to go and get is so--go get it! I didn't get to censor any mail yesterday because I was busy doing other things. So I had twice as much to censor today. I spent from 4:00 to 5:15 this afternoon on that. Nothing new or different Honey. I have a big stack of mail to censor as soon as I'm finished here. And then I'm going to bed and dream about us. After lunch I got the sun for forty-five minutes and had just gotten comfortable in my room to censor some mail when I was called down to my office. I had three emergency patients from another ship and had to take care of them. When I was through I sat in on some more of the court martial and because of its interesting matter I stayed on until the final verdict was given. Then I returned to my room finished my censoring, showered and read the Post until 5:30 when I dressed and went up for chow. It has been raining or threatening to rain all day so I spent my leisure time in my room reading and censoring mail. Hello Honey, here I am though a wee bit tight. I had my usual busy morning. Because Dr. Law and the chief engineer were both celebrating birthdays, I decided to help a worthy cause along and help with the celebration. We left the ship at 2:00 PM and our boat came back for us at 5:15 PM. So you see we had about three hours and made the most of it. By the time we got back it was too late to shower and change before chow so I'll take care of the bath before retiring. I have a mess of mail to censor but I'll take care of that later as well. After lunch I had a three day stack of mail to censor and it took me better than an hour to get the letters all read. May 24, 1945 to May 28, 1945, the Ocelot was at sea. One thing I have noticed is that there is very little letter writing going on now, not many letters to censor. However when our mail does catch up with us, there'll be plenty of mail to censor--you bet. June 18, 1945. Lt. (j.g.) Gilbert Steingart was promoted to the rank of Lieutenant. It's late, I'm sleepy and I still have a stack of mail to censor so goodnight my darling. I'll see you in dreams. Nothing new out here. I worked on patients all morning and part of the afternoon. The rest of the time I spent on the wardroom books, censoring mail and a little more reading of "Strange Woman." I'm still the busiest dentist on the ship, there aren't any others. Was swamped under all morning and worked this afternoon until 3:00 P.M. Then I had my wardroom books audited. Following which I made out an order for some more recreation gear. By then it was 4:15 so I retired to my room for some reading and relaxation. Also, I had some mail to censor. Before I knew it, it was time to shower and dress for dinner. I had time to shower, censor mail, and dress for dinner. After that we had a most enjoyable game of cribbage and now here I am. After VJ day. 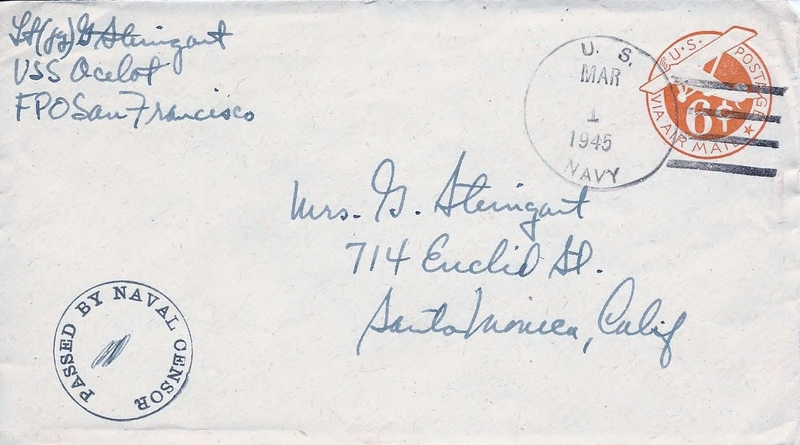 August 16, 1945. There is no dope about where we go from here. In a day or so there will be no more censorship and I'll be able to write anything I damn please. A real hot day for a change and on top of that I was swamped under with work. It was past 3:30 when I finally called it a day. Then up to my room, off with my clothes and a cold refreshing shower. After that I censored some mail and read a little from "Try and Stop Me." Yes the war is over but VJ Day is still a few days away. Until that day and until we actually occupy Japan we are still in a state of war and all wartime restrictions and precautions exist. So----censorship is still in effect and will be until the Navy Dept says otherwise. In a few days . maybe censorship will be lifted. Then there'll be lots of things I'll be able to write about. 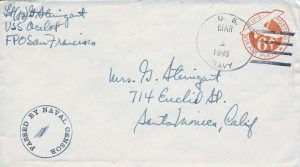 March 1, 1945 Envelope with censor stamp from World War 2. Censorship has not been lifted as yet but as soon as it is I'll have lots to tell you. Censorship rules have been relaxed to the extent that we can now say where we are but not where we are going. From the enclosed pictures you can guess where we are. If you'll look on a large map you'll find San Pedro (or Pablo) Bay in the Northern part of Leyte Gulf. We are anchored in the bay about 12 miles south of Tacloban which is the capital of Leyte ... This town is rather primitive and the civilians are poor and live in filth and squalor. However the Navy Club is nice and is open at night which explains its attraction over the others that secure at 5:00 P.M.
Hello Honey, the lid is off. Censorship ain't no mo? Fire away. Click on http://steingart.blogspot.com/2014/09/censorship-aint-no-mo.html?spref=tw to read what censorship had prevented Lt. Steingart from writing.